Photo at top: My classmate and I attending peace rallies in Nairobi, Kenya, on the International Day of Peace. I have spent the past six months navigating through the streets, people, and places of Nairobi. To assure you (and my professors), this navigating did not entail abandoning my internship and research to become a matatu driver (although that may have made for more interesting blog material). Instead, I say “navigate” because my daily journeys between my place of work, the grocery store, and my home necessitated the skillful maneuvering of my limbs between cars, boda bodas, and uneven or non-existent sidewalks. I also say “navigate” because I have been required to continuously reorient my personal and professional truths, often performing mental gymnastics as I stretched myself to see, feel, and think in ways that I had never been required to before. So how does one make sense of these navigations? 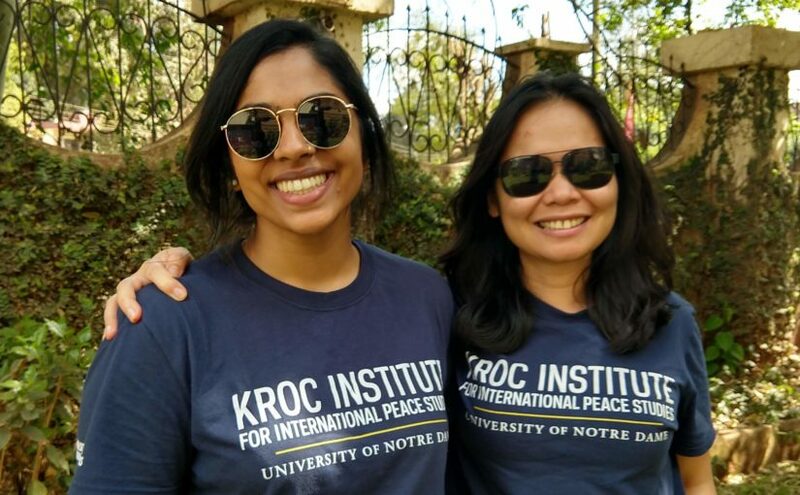 What I thought would simply be a supplementary aspect of my semester living in Nairobi and interning at the Life and Peace Institute gradually became the central component to how I made sense of the many worlds I found myself needing to traverse. I spent my first few months in Nairobi largely frustrated that I could not follow a blueprint to aid me in my physical and mental voyages. I soon realized that not only did this blueprint not exist, but it was also impossible to pen down for the inherent reason that there was no one single version of the Nairobi I was experiencing. First unconsciously and then consciously, I found myself turning to the internal process of reflection as a way to name and make sense of my surroundings. Reflective practice can be understood as a sustained and indefinite process of holding an awareness of both what happens around you, as well as within you. With no clear end and beginning, this practice allows us to untangle our observations, sit in contemplation of these observations, and potentially move towards action in response to the many things we see, feel, and think. In its simplest form, it is a two-way commitment: one to continued learning through a deliberate decision to be vulnerable and another to uncovering a kind of visceral knowledge we hold through mindful presence. Nairobi is anything but one-dimensional or static. Rather, it is a place textured by multiple worlds that overlap, contradict, and co-exist. 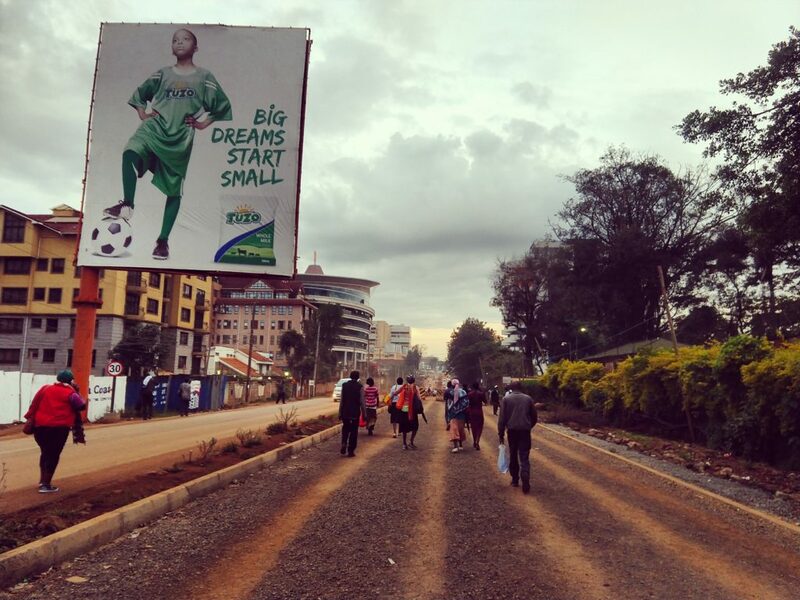 The most tangible example of this description can be observed in the spatial layout of the city, where Kibera – one of the largest slums on the African continent – is surrounded by Lavington, Kilimani, and Kileleshwa – some of the wealthiest suburbs of Nairobi. Through my internship at the Life and Peace Institute, I was able to enter spaces of Nairobi that someone like me, the mzungu, would otherwise not have been expected to be found. Whether it was attending town hall meetings with community leaders in Mathare or Sustained Dialogue sessions with youth in Eastleigh, these experiences cultivated a sort of internalizing, which left me always “switched on.” By engaging with reflective practice, I was able to discern what my presence meant in these spaces, as well as the privilege of my mobility to traverse between the worlds of Nairobi’s slums and suburbs. 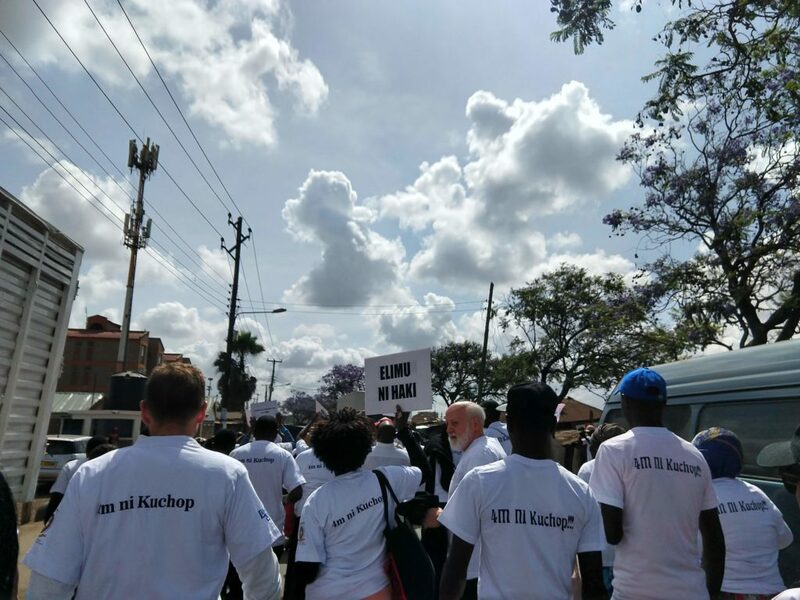 Participating in a peace action march in Eastleigh with Life and Peace Institute’s board members and community members to raise awareness of the need for better schooling support. There is an immediacy of physical and mental presence that you cannot escape when you walk through the streets of Kibera or share a meal of sukuma wiki and ugali with youth leaders, or have someone you barely know invite you to their humble home in Kawangware to make chapatis on a Saturday afternoon. Through the sharing of meals and laughter, the stark realities of structural violence demanded an intimate solidarity that pushed me closer to the worlds I would otherwise never be exposed to, even if only for a few hours. Mathare at dusk. This photo was taken on a visit to my colleague and friend’s home. 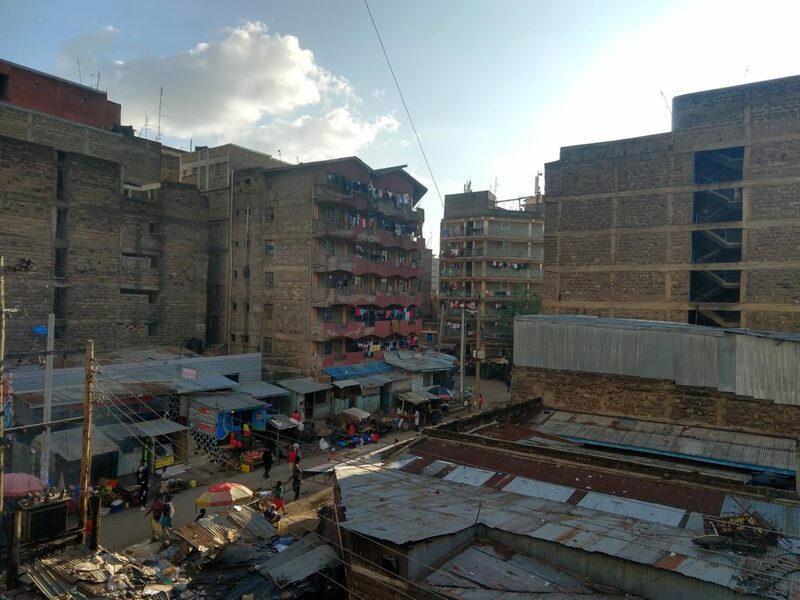 Despite the close physical proximity of unequal worlds, Nairobi, like many cities, allows for distance and disconnect. This is because so much of the worlds we have created employ distance from the “other” so that we are not required to actively engage with the injustices we see. The distance allows us to not stop and see our role in both the atrocities and achievements of humanity. This distance dehumanizes us. Choosing to reflect means closing that distance and going beyond the dualistic thinking of victim and perpetrator, rich and poor, or peaceful and violent. Reflection demands we see our agency and the structures surrounding us as a struggle against a world that would otherwise tell you to not feel, think, and see. The daily practice of capturing my observations and thoughts through writing prompted me to find the language for experiences I would otherwise not have been able to articulate. In some instances, it also forced me to step away from the sometimes clinical and technical phrases we can throw around when operating from the stance of a peacebuilding practitioner or academic. But the power of reflection is not so much in the act of writing down words, but in the recognition that we cannot accept what we see in front of us and rather that we must journey internally and address the very questions we would rather not grapple with on a daily basis. The daily commute: a short walk at the end of the day for me, but for many of my fellow pedestrians this was the first part of their long journey home. I have come to embrace reflective practice as liberatory and an act of resistance: going beyond the binaries, refusing to be detached, and humanizing the experiences of the worlds we traverse. It is an active decision to sit in the uncomfortable and difficult space of untangling an encounter that we would prefer to normalize and not acknowledge. Reflection is a practice of daily resistance that is demanded of everyone, regardless of professional inclination or geographical location. It is the realization that things are not simply the way we see them to be at first sight. It is a practice that requires us to recognize we don’t in fact know it all or have a full grip on what it means to be a peacebuilder. Instead we must recognize that we are constantly learning and unlearning our ways of being in the worlds we traverse. Reflective practice provided with me something. It was more than a map. It provided me with an internal compass to make sense of the many things I was seeing, feeling, and thinking as I developed within my vocation as a peacebuilder.